During yesterday’s session, I discussed the lack of a run to safe-havens in the wake of the mass shooting in Las Vegas. It is commonplace for investors to take a risk-off stance during periods of unrest or surprise. Monday’s trade of the USD/CHF showed no adherence to this notion. Today’s forex session has seen quite the opposite. The USD/CHF has posted a nice retracement, bringing downside support levels into play. The technical picture facing the USD/CHF is becoming a bit clearer. Thus far, USD/CHF is trading off of highs by 40 pips. Early bullish trade above September’s high of .9769 has been replaced by U.S. session intraday weakness. 38% of Monday’s range is .9725. Today’s low of .9728 has served as a proximity test of this level. The round number of .9800 will serve as an intermediate-term psychological level. The USD/CHF has not traded .9800 since June. It is not listed on the chart, but 38% of 2017’s range is at .9770. 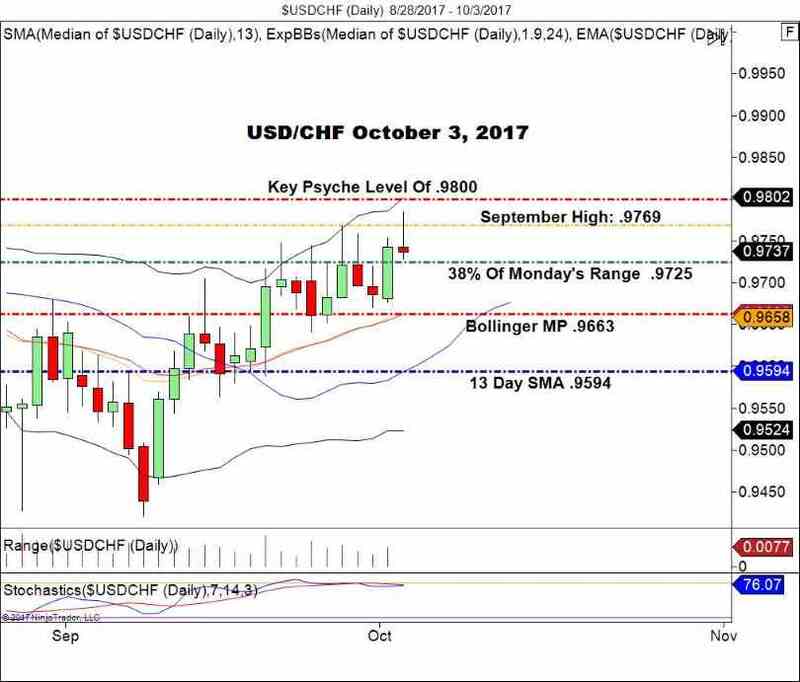 September’s high looms large in future scenarios facing the USD/CHF. It serves as a test of the yearly 38% Fibonacci level, which is formidable resistance. Today’s failure above this level shows its validity. Bottom Line: In my opinion, we are not done with .9770. However, gaining advantageous trade location is not in the cards for today. About the only thing we can do is go long at market now and place our stops beneath the intraday low for a 1:1 R/R long. If compression becomes evident in the coming sessions, then a playing a rotational strategy is optimal. Fading the extremes from our established support and resistance levels could be the best way to go. For now, I recommend a wait and see approach. If this market tightens, as is common for the USD/CHF, then we will be a good position to trade it efficiently.